Indeed, a very handsome portrait...Beautifully done! Beautiful closeup. Congrats on the award. congrats on the double award my dearest Srna!!!! What an adorable picture of this beautiful dog. Something / someone definitely has his attention. Kindly thank you my dear Paul, appreciated so very much your constant support and efforts, you are so kind and nice my friend. Bonito perro y un buen disparo! Lovely pet portrait Srna. Beautiful colors and wonderful lighting. Love the backlight. Excellent details and dof. Great technique as always. A beautiful capture. Is this guy your dog? :-).. Cute portrait may dear friend.. and shooted et the right moment. Excellent shot Srna and the sense the dog is driving a cabrio. Congratulations, have a nice weekend. you say it all in the about my friend srna,. i'll just add i love the frizzy hair,. splendid capture,. best regards art,. 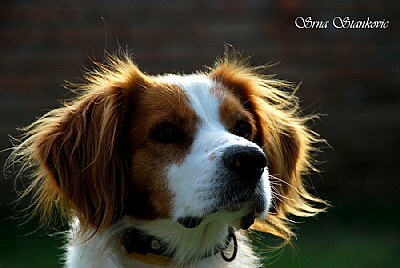 An excellent doggy portrait Srna.He does have a very alert expression.Very well captured. superb capture my dear Srna!!! perfectly focused!!! Thank you Ayan very much, appreciated. Perfectly focused srna, nice composition.